"Panamericana" redirects here. For the film, see Panamericana (film). Not to be confused with CANAMEX Corridor. The Pan-American Highway from Prudhoe Bay, U.S.A. to Quellón, Chile and Ushuaia, Argentina, with official and unofficial routes shown in Mexico and Central and South America. A few selected unofficial routes shown through the United States and Canada as they existed in the early 1960s. In 1966 the new U.S. Interstate highway system brought official status to most previously unofficial routes in the lower 48 states. 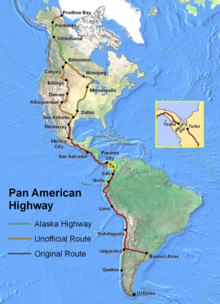 The Pan-American Highway  is a network of roads stretching across the American continents and measuring about 30,000 kilometres (19,000 mi)  in total length. Except for a rainforest break of approximately 160 km (100 mi), called the Darién Gap, the roads link almost all of the Pacific coastal countries of the Americas in a connected highway system. According to Guinness World Records, the Pan-American Highway is the world's longest "motorable road". However, because of the Darién Gap, it is not possible to cross between South America and Central America with conventional highway vehicles. Without an all-terrain vehicle, it is necessary to circumnavigate this terrestrial stretch by sea. In practice the concept of the Pan-American Highway is more publicly embraced in Latin American countries than in North America. Much of the road system in Latin America is explicitly marked as Pan-American (commonly Vía Panam). Map of the Alaska Highway portion (in red) of the Pan-American Highway system. 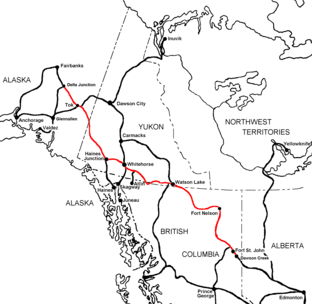 The Alaska Highway through Alaska, Yukon and British Columbia is commonly considered a de facto northerly extension of the Pan-American Highway, as well as the Dalton Highway in Alaska. In Canada, no particular road has been officially designated as the Pan-American Highway. The National Highway System, which includes but is not limited to the Trans-Canada Highway, is the country's only official interprovincial highway system. However, there are several Canadian routes that are a natural extension of several key American highways that reach the Canada–US border. British Columbia Highway 97 and Highway 2 to Alberta both pick up where the southern end of the Alaska highway leaves off. Highway 97 becomes U.S. Route 97 at the Canada–US border. British Columbia Highway 99 provides an alternate route from Highway 97 just north of Cache Creek that runs through Whistler and Vancouver before ending at the Canada–US border at the north end of Interstate 5 in Washington State, the beginning of the official Pan-American route south of British Columbia. Meanwhile, Alberta Highway 2 runs south and east to Alberta Highway 3 leading into Lethbridge, then south on Alberta Highway 4 to the Canada–US border where it becomes Interstate 15 in Montana, the first official stretch of the Pan-American Highway south of the Alberta route. I-5 Runs north from San Diego to Seattle then links indirectly with British Columbia Highway 97 north of the Canada–US border. A technically direct link between the same interstate and the highway 97 system can be found near Weed, California. US route 97 runs northeast then north from this junction and becomes BC highway 97 at the border with Canada. I-15 links San Diego with Alberta Highway 2 that eventually crosses into British Columbia and ends at the southern terminus of the Alaska Highway. Interstate 8 provides an east-west link from San Diego to Interstate 10 near Phoenix, Arizona. The latter continues to Tuscon and links with Interstate 19 that becomes a spur of the Pan-American highway through Mexico at the Nogales border crossing. Interstate 25 runs north from Interstate 10 at Las Cruces, New Mexico to Interstate 90 in Wyoming. This route has no direct extension into Canada, but links indirectly to Interstate 15. Interstate 25 in Albuquerque, New Mexico, was named the Pan-American Freeway, :248 as an extension of highway 45, the Mexican spur linking El Paso to the original route along highway 85 north of Mexico City. This portion of I-25 largely follows the historic Camino Real, and thus serves a culturally significant portion of the Pan American system. Like I-15, the complete route of Interstate 25 is an official northerly continuation towards Alberta, where Highway 2 provides a direct but unofficial Canadian link to the Alaska Highway. Interstate 35 is a northerly continuation of the original Pan-American highway following Mexican Federal Highway 85. It extends from Laredo, Texas to the Canada–United States border north of Duluth, Minnesota with a spur, Interstate 29, that leads farther west towards Winnipeg, Manitoba. The section of Interstate 35 in San Antonio, Texas is referred to as the Pan Am Expressway by locals. I-35 is a northerly continuation of Mexico Highway 85, the original official Mexican route, ending in Duluth, Minnesota, where Minnesota State Highway 61 continues to the Canada–US border near Thunder Bay, Ontario. The Trans-Canada Highway provides a link from Winnipeg and Thunder Bay to Alberta and the Alaska Highway, but is not officially part of the Pan-American Highway. An additional route only partially complete is Interstate 69 which will eventually run northeasterly from the same Laredo border crossing to the Windsor-Quebec City Corridor in Canada where the route becomes unofficial. The CANAMEX Corridor is designated from Mexico City to the western United States from Arizona to Montana,  and continues north into western Canada. With the lack of any official status for the Pan American Highway in Canada, this is the only official North American highway that runs through Canada, the U.S., and Mexico to link the Alaska Highway with the Pan-American Highway at Mexico City. Unlike corresponding Pan American routes in the American southwest, The Canamex Highway bypasses San Diego by using several non-interstate highways to provide a shortcut from I-15 at Las Vegas, Nevada to I-10 at Phoenix Arizona for traffic accessing I-15 from the Nogales border crossing. The NAFTA Superhighway tag has been unofficially used in connection with Interstate 35 from Laredo, Texas to the Canadian border that downgrades to a non-freeway route ending at Thunder Bay, Ontario. 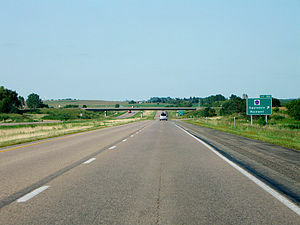 A spur follows Interstate 29 to the border that also downgrades to a regular highway that extends to Winnipeg, Manitoba. The NAFTA highway also sometimes unofficially includes Interstate 69 which is mostly complete from the Canada–US border at Port Huron, Michigan, to western Kentucky. In Canada, Ontario Highway 402 and other freeways in the Windsor-Quebec City Corridor can be considered a northeastward extension of this version of the NAFTA superhighway. To the southwest, from western Kentucky to the Mexican border, there is currently no single superhighway yet completed. Pending completion of I-69, the main highway links to Mexico follow parts of US routes 45 and 51 from Kentucky to western Tennessee, I-155 into Missouri, parts of Interstates 55 and 40 from Missouri to Arkansas, and I-30 to the Texas stretch of I-35 that continues to the Mexican border at Laredo, Texas. The incompleted section of I-69 south of Kentucky is expected to eventually continue southwestward to the Texas Gulf Coast. It will have a spur linking to the original Pan-American route through Mexico to Laredo, and additional branches extending to the Mexican spurs that cross the border at Pharr, Texas, and Brownsville, Texas. 1933 map of the Inter-American Highway portion of the Pan-American Highway. Pan-American Highway in Chimaltenango ( Guatemala), 2001. The Pan-American (or Inter-American) highway passes through the Central American countries with the highway designation of CA-1 (Central American Highway 1). In Guatemala, it passes through 10 departments, including The Department Of Guatemala, where it passes through Guatemala City. In El Salvador, it passes through the cities of Santa Ana, Santa Tecla, Antiguo Cuscatlán, San Salvador, San Martín, San Miguel, and crosses the border into Honduras at Amatillo. From Honduras, it passes into Nicaragua, passing through the Nicaraguan cities of Somoto, Estelí, Sebaco, Managua, Jinotepe, and Rivas before entering Costa Rica at Peñas Blancas. 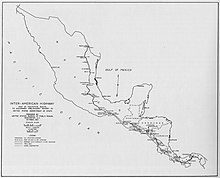 In Costa Rica, it passes through Liberia, San José, Cartago, Pérez Zeledón, Palmares, Neily, before crossing into Panama at Paso Canoas. 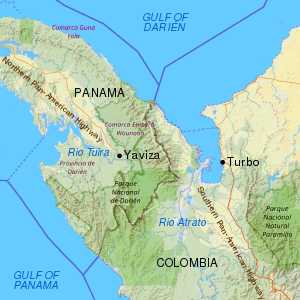 In Panama, it crosses the Panama Canal via the Centennial Bridge, and ends at Yaviza, at the edge of the Darién Gap. The road had formerly ended at Cañita, Panama, 180 km (110 mi) north of its current end. United States government funding was particularly significant to complete the high-level Bridge of the Americas over the Panama Canal, during the years when the canal was administered by the United States. Belize was supposedly included in the route at one time, after it switched to driving on the right. Prior to independence, as British Honduras, it was the only Central American country to drive on the left side of the road. The Pan-American Highway is interrupted between Panama and Colombia by a 100 km (60 mi) stretch of marshland known as the Darién Gap. The highway terminates at Turbo, Colombia and Yaviza, Panama. Because of swamps, marshes, and rivers, construction would be very expensive. Efforts have been made for decades to eliminate the gap in the Pan-American highway, but have been controversial. Planning began in 1971 with the help of United States funding, but this was halted in 1974 after concerns raised by environmentalists. Another effort to build the road began in 1992, but by 1994 a United Nations agency reported that the road, and the subsequent development, would cause extensive environmental damage. There is evidence that the Darién Gap has prevented the spread of diseased cattle into Central and Northern America, which have not seen foot-and-mouth disease since 1954, and since at least the 1970s this has been a substantial factor in preventing a road link through the Darién Gap. The Embera-Wounaan and Kuna have also expressed concern that the road could bring about the potential erosion of their cultures. The Darién Gap has challenged adventurers for many years. A 1962 expedition with three Chevrolet Corvair rear-engine cars [and two support trucks] completed the trip south [from Chicago] through to the Columbian border . A 1971-72 British expedition from Alaska to Argentina attempted to transit the Gap with two standard production Range Rovers, supported by a team of Land Rovers. They barely succeeded in thrashing a passage through the extreme terrain. In 1979 a team led by Mark Smith drove standard production CJ7-model Jeeps from South to North, traversing the Gap - with difficulty. In June 1984, Loren and Patty Upton took 741 days slogging, winching, chopping and digging their way through the inhospitable jungles of the Darién Gap. One proposed option to bridge the gap is a short ferry link from Colombia to a new ferry port in Panama,  with an extension of the existing Panama highway that would complete the highway without violating these environmental concerns. A Vía PanAm shield sign is sometimes found on routes in South American countries (such as Chile) associated with the Pan-American Highway. Sculpture of a native man standing at the entrance of Fusagasugá, Colombia, over the Highway 40. The southern part of the highway begins in northwestern Colombia, from where it follows Colombia Highway 62 to Medellín. At Medellín, Colombia Highway 56 leads to Bogotá, but Colombia Highway 25 turns south for a more direct route. Colombia Highway 72 is routed southwest from Bogotá to join Highway 25 at Murillo. Highway 25 continues all the way to the border with Ecuador. Another route, known as the Simón Bolívar Highway, runs from Bogotá (Colombia) to Guiria (Venezuela). It begins by using Colombia Highway 71 all the way to the border with Venezuela. From there it uses Venezuela Highway 1 to Caracas and Venezuela Highway 9 to its end at Guiria. Monument on the Equator on the highway near Cayambe, Ecuador. Ecuador Highway 35 runs the whole length of that country. Peru Highway 1 carries the Pan-American Highway all the way through Peru to the border with Chile. In Chile, the highway follows Chile Route 5 south to a point north of Santiago ( Llaillay), where the highway splits into two parts, one of which goes through Chilean territory to Puerto Montt, where it splits again, to Quellón on Chiloé Island, and to its continuation as the Carretera Austral. The other part goes east along Chile Route 60, which becomes Argentina National Route 7 at the Argentinian border and continues to Buenos Aires, the end of the main highway. The highway network also continues south of Buenos Aires along Argentina National Route 3 towards the city of Ushuaia in Tierra del Fuego. Another branch, from Buenos Aires to Asunción in Paraguay, heads out of Buenos Aires on Argentina National Route 9. It switches to Argentina National Route 11 at Rosario, which crosses the border with Paraguay right at Asunción. Other branches probably exist across the center of South America. 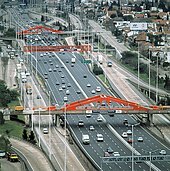 A continuation of the Pan-American Highway to the Brazilian cities of São Paulo and Rio de Janeiro uses a ferry from Buenos Aires to Colonia in Uruguay and Uruguay Highway 1 to Montevideo. Uruguay Highway 9 and Brazil Highway 471 route to near Pelotas, from where Brazil Highway 116 leads to Brazilian main cities. The highway does not have official segments to Belize, Guyana, Suriname and French Guiana, nor to any of the island nations in the Americas. However, highways from Venezuela link to Brazilian Trans-Amazonian highway that provides a southwest entrance to Guyana, route to the coast, and follow a coastal route through Suriname to French Guiana. In the British motoring show Top Gear, the presenters drove on a section of the road in their off-road vehicles in the Bolivian Special. Pan-American Highway through San Martin, El Salvador. Another view of the Pan-American Highway in El Salvador. Pan-American Highway in El Salvador between Lourdes and Santa Ana; this flat 1.5 km long straight section can be used as an airstrip and it was used during El Salvador Civil War. Pan-American Highway in Tres Rios, Costa Rica, right before the toll plaza (about 337 more km to go until the Panamanian border). GMC Suburban traveled all of the Pan-American Highway. Patagonia, Chile. Panamericana - Pan American Highway - in the Cordillera de los Andes, southern Ecuador, near to Catacocha, 2500m / 8000 ft Elev. ^ "Highway Run". Harper's: 70–80. July 2006. ^ Bryan, Howard (1989). Albuquerque Remembered. Albuquerque: University of New Mexico Press. ISBN 978-0826337825. OCLC 62109913. Retrieved 13 February 2013. ^ "Datos Viales de Hidalgo" (PDF) (in Spanish). Dirección General de Servicios Técnicos, Secretaría de Comunicaciones y Transportes. 2011. p. 5. Archived from the original (PDF) on 2012-05-14. Retrieved 2012-01-26. ^ "Federal Definition". Canamex coalition. Archived from the original on 2008-01-10. ^ "'Super corridor' theories simply updated old idea". The Star Phoenix. August 28, 2007. Archived from the original on March 1, 2015. Retrieved 2008-04-15. ^ "Datos Viales de Puebla" (PDF) (in Spanish). Dirección General de Servicios Técnicos, Secretaría de Comunicaciones y Transportes. 2011. pp. 2–3. Archived from the original (PDF) on 2012-05-14. Retrieved 2012-03-29. ^ "República de Guatemala – Red Vial con Distancias" (PDF) (in Spanish). Instituto Geografico National (IGN); Ministerio de Comunicaciones Infraestructura y Vivienda (CIV). 2009. Archived from the original (PDF) on 2013-05-11. Retrieved 2012-04-09. ^ "Range Rover Darien Gap - Range Rover Classic". ^ "The Coming Era of Mega Systems, Part 1 – Transportation". DaVinci Institute – Futurist Speaker. 2014-12-16. Retrieved 10 February 2017. ^ "Pan-American Highway – MSN Encarta". Archived from the original on 2008-05-13. Retrieved 2008-09-19. ^ Cahill, Tim (1992). Road Fever. Vintage. ISBN 978-0-394-75837-4. ^ Walker, Tim (29 September 2005). "How to have a real adventure: Take a train or get on a bike to experience the thrill of travel as it used to be". The Independent (UK). Retrieved 3 August 2010. ^ "British cyclist smashes Pan American Highway record after learning of royal wedding invitation". road.cc. 2018-05-14. Retrieved 2018-10-02. ^ "Kombi Life". YouTube. Retrieved 2018-11-18. ^ Fairbanks, Dan Bross, KUAC -. "Kombi Life shows two partners traveling from South America to Alaska". Alaska Public Media. Retrieved 2018-11-18.